Local social enterprise Adventure Circus has today announced the launch of a pay it forward ticketing scheme for their upcoming circus production, Seasons. Pay it forward is a movement where someone does something for someone else, but does not expect anything in return. Adventure Circus is urging local people to hop onto their website and buy a ticket for their show on 12 November, and also an extra ticket for someone else to enjoy! The beneficiaries of all pay it forward tickets donated will be PKAVS Young Carers, and individuals counselled by Mindspace Perth. For every pay it forward ticket purchased, Adventure Circus will also pay forward a ticket, so that guests can enjoy the show with a friend. 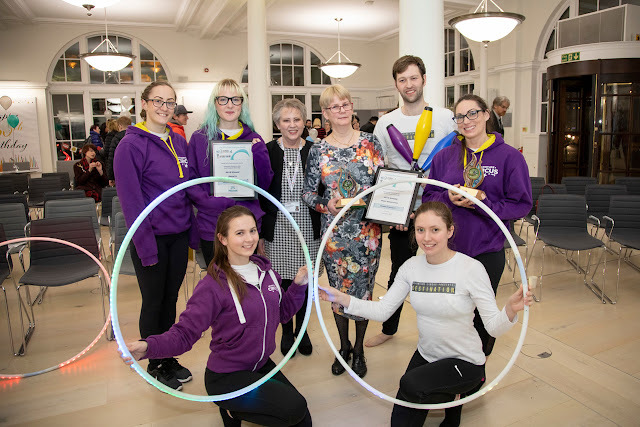 Adventure Circus Director Gemma Simpson had heard about the success fellow social enterprises have had using pay it forward schemes, and Adventure Circus are keen to replicate this success so that as many people in Perth as possible can enjoy watching and participating in circus skills. The show is a collaboration of both our professional instructors and our students work, and is our first theatre production in Perth. We are working in partnership with Perth College sound and lighting students, in their Goodlyburn Theatre, which is an excellent stage to showcase our creativity. The show will combine, single, double and even triple performances on trapeze, unicycle, silks, lyra and rope! Special guests from Edinburgh are also in the line up, visiting Perth to show off their fire and hooping skills. You can buy your tickers, and pay it forward tickets here. All proceeds will go towards growing Adventure Circus's performance department, so that more shows can take place in Perth, helping to support Perth's 2021 City of Culture Bid.